New Scientist and Nature both thought the speculation about “Denny” (the fictional offspring of a Denisovan and a Neanderthal) was one of the top stories of 2018, so let’s tell the whole story from the beginning. Denny is fictional—but Svante Pääbo is the real person at the center of the story. He first appeared on the scene in 1985 when he published an article about ancient Egyptian mummy DNA. 1 This led to his work on molecular cloning and enzymatic amplification which allowed him to extract DNA from a frozen mammoth carcass in 1994. 2 He kept trying to extract DNA from older and older sources, and turned his attention to Neanderthals in 1997. He has been a recognized expert in extracting DNA from ancient sources for over 30 years. Those of us who watched the O.J. Simpson murder trial (in 1994) remember the expert testimony about how quickly DNA degrades, so we might reasonably dispute the accuracy of analysis of DNA from old bones—but we won’t. That argument would be too boring and technical. Let’s just assume the DNA analysis is accurate—even if it might not be. Svante Pääbo has been analyzing ancient DNA for a long time, and his peers trust his analysis. The Denisovan speculation began in 2010. In the summer of 2008, Russian researchers dug up a sliver of human finger bone from an isolated Siberian cave. The team stored it away for later testing, assuming that the nondescript fragment came from one of the Neanderthals who left a welter of tools in the cave between 30,000 and 48,000 years ago. Nothing about the bone shard seemed extraordinary. Its genetic material told another story. When German researchers extracted and sequenced DNA from the fossil, they found that it did not match that of Neanderthals — or of modern humans, which were also living nearby at the time. The genetic data, published online in Nature, reveal that the bone may belong to a previously unrecognized, extinct human species that migrated out of Africa long before our known relatives. The fossil in question is a tiny bone fragment which is assumed to be a fingertip of an unknown human species. In the past, new species were based upon a distinctive “type fossil,” usually a tooth or skull. In this case, the new species is based on DNA that doesn’t match modern human or Neanderthal DNA. It must not match any known ape DNA, either, or they would have identified it as an ape finger. We are told ape DNA is 98% the same as human DNA. If the unknown DNA is close to (but not exactly like) human DNA, it must be close to ape DNA, too Why assume it came from an unknown human rather than an unknown ape? Is a sliver of a human finger that much different from a sliver of an ape finger? Apparently they were hoping to find something that could be construed to be a new human species because, "This really surpassed our hopes," says Svante Pääbo. Could hope have biased their analysis? 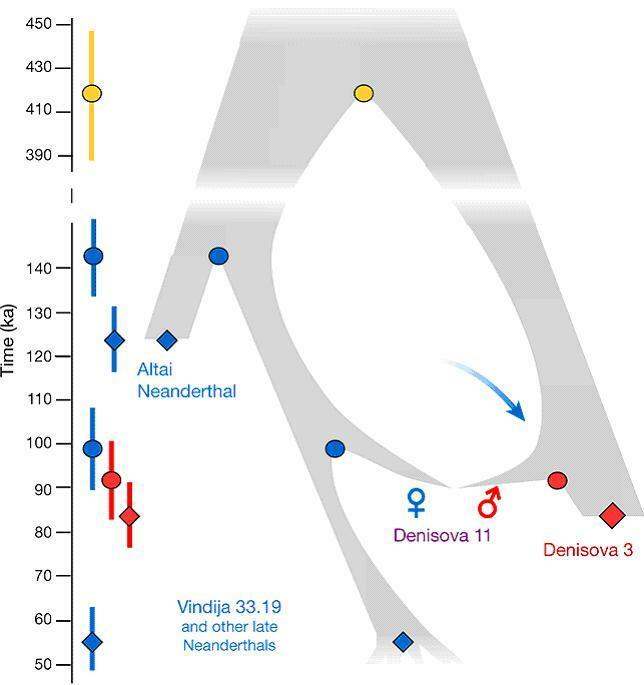 Although a Neanderthal mtDNA genome differs from that of Homo sapiens at 202 nucleotide positions on average, the Denisova Cave sample differed at an average of 385 positions. They are making a vast conclusion based on half-vast data. Reasonable people should question the existence of an unknown species that had to have made an unknown migration without any supporting evidence other than DNA that doesn’t match Neanderthal DNA. That was the background from about a decade ago. Let’s move on from that ancient history to the new discovery. The bone is only 26 mm (about 1 inch) long, so it is shorter than a toothpick. How do they know it is from a Denisovan? We are glad you asked! Denny’s bone fragment was the first to be classified as hominin using this technique, described in a 2016 paper before her DNA had been extracted and sequenced. They have examined hundreds of tiny bone fragments like this one, and think Denny (and four others) might have come from a prehistoric human. Since the only traces of Denisovan DNA found in modern humans comes from people living thousands of miles away, a more logical conclusion (than the speculation that Denisovans once lived all across Asia) is that the genetic similarity is a coincidence. In 2011, the only “known” fossil remains of Denisovans were one bone and one molar. I could not find any reason for why they believe that molar came from a Denisovan; nor could I find any other reference to Denisovan fossils discovered before Denny. But there could be other fossils which will someday be discovered that “could bear traces” of Denisovan DNA—wishing might make it so! Neanderthals and Denisovans are extinct groups of hominins that separated from each other more than 390,000 years ago. Here we present the genome of ‘Denisova 11’, a bone fragment from Denisova Cave (Russia) and show that it comes from an individual who had a Neanderthal mother and a Denisovan father. The father, whose genome bears traces of Neanderthal ancestry, came from a population related to a later Denisovan found in the cave. The mother came from a population more closely related to Neanderthals who lived later in Europe than to an earlier Neanderthal found in Denisova Cave, suggesting that migrations of Neanderthals between eastern and western Eurasia occurred sometime after 120,000 years ago. The finding of a first-generation Neanderthal–Denisovan offspring among the small number of archaic specimens sequenced to date suggests that mixing between Late Pleistocene hominin groups was common when they met. Neanderthals and Denisovans inhabited Eurasia until they were replaced by modern humans around 40,000 years ago (40 ka). Neanderthal remains have been found in western Eurasia, whereas physical remains of Denisovans have thus far been found only in Denisova Cave, where Neanderthal remains have also been recovered. Although little is known about the morphology of Denisovans, their molars lack the derived traits that are typical of Neanderthals. Supposedly, an unknown human ancestor (the yellow circle in the diagram below) evolved into Neanderthals (blue) and Denisovans (red) about 415,000 years ago (not 1 million years ago as Dalton said in 2010). Then, a Neanderthal man and a Denisovan woman got together about 90,000 years ago to produce a girl who left a bone fragment designated Denisova 11 in a Russian cave. It is an interesting story—but what’s the proof? The “proof” is nothing more than DNA that is like Neanderthal DNA in some respects, and like Denisovan DNA in some respects. “The father, whose genome bears traces of Neanderthal ancestry” is purely speculative. Without a birth certificate (or the help of Maury Povich 10 ) they assume the father must have been Denisova 3. They didn’t analyze the DNA of the mother because they don’t know who she was, and don’t have any DNA from the mother to analyze. They just assume she must have been a Neanderthal. They think they have demonstrated that Neanderthals mixed with Denisovans. What they actually demonstrated is that they mixed a fact (a specific DNA sequence) with speculation (about how that sequence arose). The only reason they believe Neanderthals and Denisovans mated is because they think Neanderthals and Denisovans must have mated, and they have imagined the DNA of such a mating could have been like the DNA they analyzed.